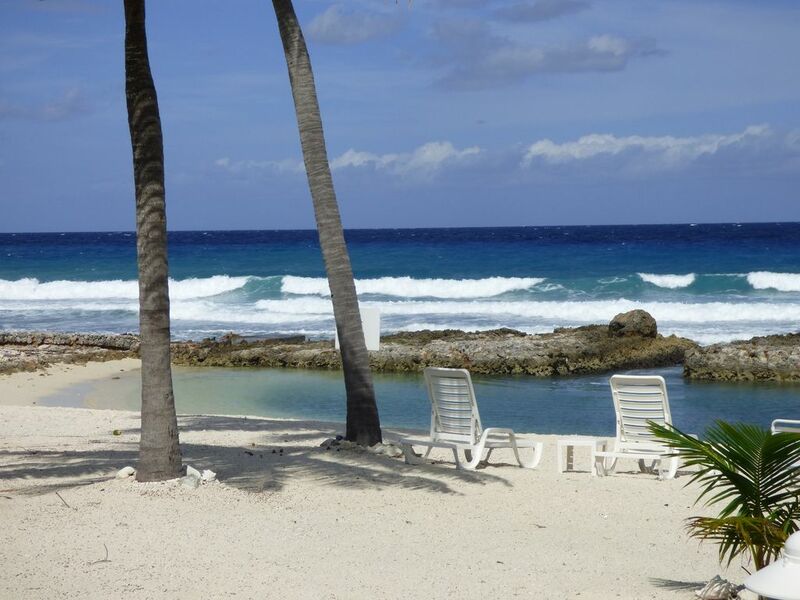 You won’t need to bring anything but your bathing suit, shorts and some t-shirts to enjoy your trip to Grand Cayman. This luxury oceanfront condo provides everything. Located directly on the beautiful waters of the Caribbean Sea, the panoramic views and nearby water sport activities mean you need not venture far to enjoy all the island has to offer. This private and peaceful resort is the perfect place to relax and enjoy as the tropical trade winds blow your troubles away. Only 30 minutes from the airport and the downtown George Town shopping area, On The Bay is a 12 unit complex situated on beautifully landscaped grounds on the quiet North Side of Grand Cayman. Go for a refreshing swim in the pool or take a dip in the private cove fed by the sea. Snorkel right from the beach, or take a stroll in the sand. It’s all right at your doorstep. If you’re looking to take a boat trip, ride a waverunner, or go scuba diving, these activities are only 10 minutes away at Rum Point. If you enjoy hiking, the Mastic Trail is only 5 minutes away, as is the beautiful Queen Elizabeth II Botanic Park with its magnificent gardens of orchids and local flora. Nearby restaurants provide both casual and fine dining. We can’t say enough wonderful things about our stay! From sleeping to the sounds of the waves to the kids basically having their own private pool the whole week! We will definitely be back! The location was just as described, private, low key and beautiful. We loved being able to drive to Rum Point to spend the morning and then come back for the kids to swim in the afternoon. So many wonderful things to see and do and Mark was such a great host! Thank you so much for sharing your home with us! We always enjoy our stay at On The Bay. Great weather all week and just a relaxing part of the island. We absolutely loved the condo with the spectacular views. It was in a great location and had everything needed for a wonderful stay. I hope to go back in the future. Fantastic unit. Larger than pictures can really show. Fantastic porch and view. This is a great unit for a family. Sandy beach area and nice pool. It is on the quit side of the island which we prefer. From the minute we arrived and saw the awesome views and condo we were truly on a vacation. The location is in the quiet North side, which we prefer, for reading and relaxing. At the local Island Bites the food is great, and our last night we ate at Rum Point Club which was delicious. A car is needed for this location but we tackled the driving on the left and roundabouts. Everything was perfect including the condo. We had a fun week in this beautiful property on the quiet side of the island. Furnished with everything you might want for the perfect holiday plus the beach and pool added to our enjoyment. Only downside was the failure of the property manager Mitzi to return our calls about the leaking dishwasher. Will definitely return!